Chelsea State Bank is a local bank in Southeast Michigan that has been serving the Chelsea area for over 100 years and are looking to expand into surrounding communities. They offer a wide range of financial services and products to both individual and commercial customers, and they recently received an A+ financial health rating from one of the leading national health monitoring publications, DepositAccounts.com. 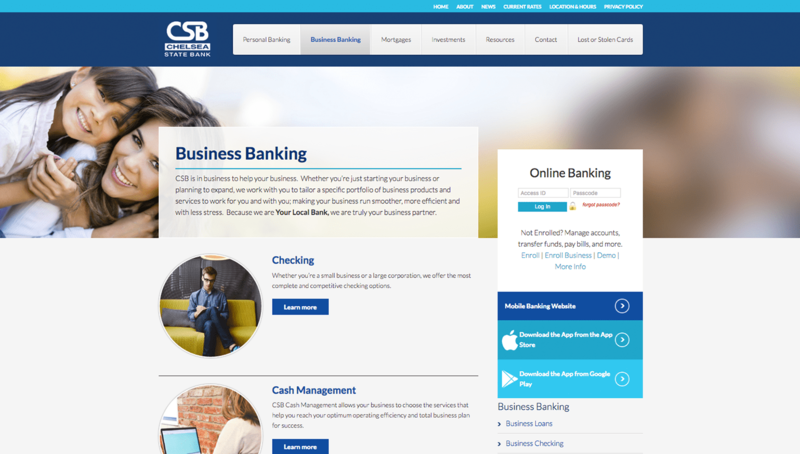 Chelsea State Bank came to Web Ascender with an outdated website that wasn’t effectively appealing to and engaging their customers, making lead generation difficult. Their web presence was hard for users to navigate, preventing the bank from using their website to help grow the business. They partnered with Web Ascender to improve visual appeal and increase engagement while building an online presence that was reflective of the quality service they are known for. 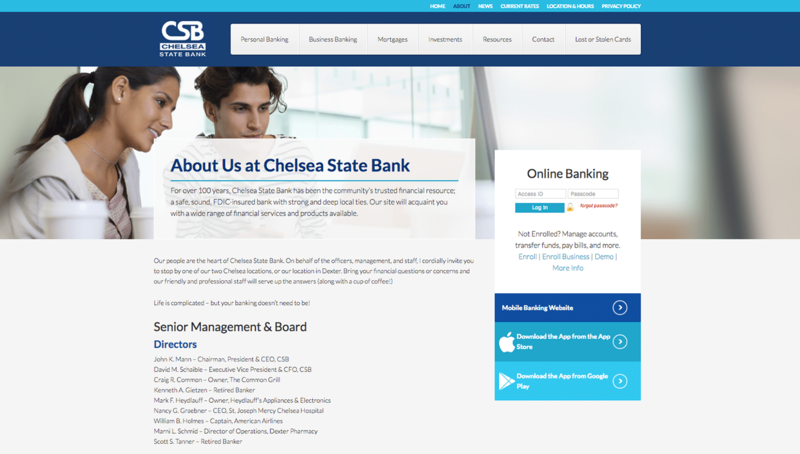 Working with their existing content to make the site more engaging, we built Chelsea State Bank a brand new website using WordPress. The result was a visually appealing online experience, designed to draw in users and funnel them to taking the next steps in contacting Chelsea State Bank. The website also features changing page banners with eye-catching photos of their target audience, further engaging and connecting people coming to the site. To further build and strengthen their online presence, Chelsea State Bank enlisted the efforts of our Internet Marketing team to implement inbound marketing strategies. 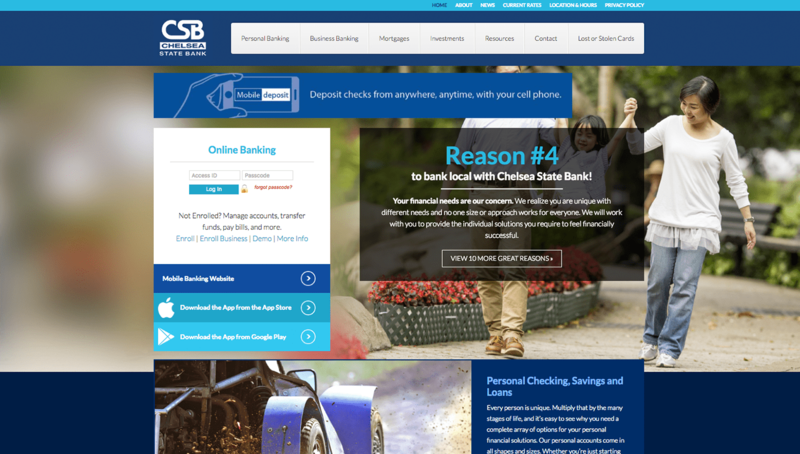 We work with Chelsea State Bank on an ongoing basis to develop and execute campaign strategies in order to increase organic traffic and improve lead generation. This included the creation of content offers, relevant blogging topics to attract the right visitors via search, compelling calls-to-action, targeted landing pages, plans for content promotion, and lead nurturing. Since launching the site, Chelsea State Bank has received nothing but great feedback from their customers. They are thrilled with the user-friendliness and also the site’s ability to bring in new business.